It must run in the family. The thrifting gene. It had peeling veneer, a scratched top, and was covered all over in dust, but my fingers couldn’t type “GET IT!” fast enough to make my thrifty heart happy. My mom might be as much of a thrift store addict as I am. And she just knew I’d be all over this abandoned coffee table. She was so right. This one was easy, and I’m sorry to say I was so speedy about it that I didn’t even write a tutorial about the makeover process. I’m slacking y’all! I love you, I promise. All it took was a quick cleaning, some wood putty for the damaged corner, two coats of Valspar Blackstrap paint, and a few 1×4 boards finished with my favorite DIY stain, and this baby was ready for a new life. 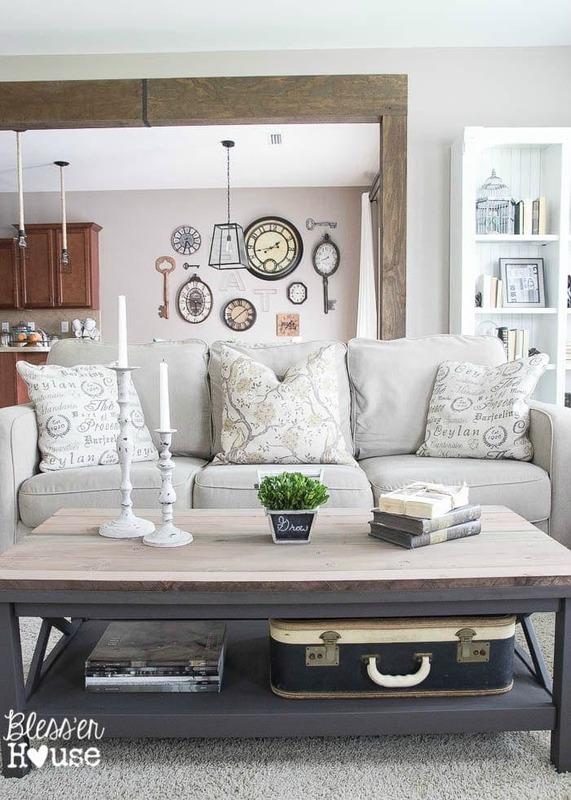 Ahem…do you see that AMAZING wood beam doorway behind our sofa? Just wait, friends. That’s a comin’. If it weren’t for our dire need of toy storage in our living room with our card catalog coffee table trunk, I would have been ready to keep this one. But its new owner will be picking it up tomorrow. I’m sorry, little table; it’s me not you. Moral of the story though: If you ever come across a table that has veneer peeling up and a horribly scratched top, wood planks and wood putty are your best friends. 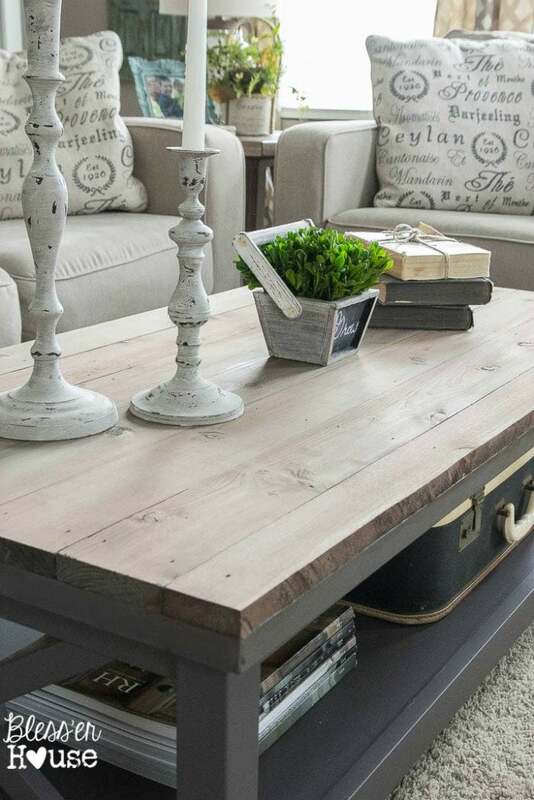 It almost reminds me of those steel and reclaimed wood tables I see everywhere now. I really don’t think I’ll ever get tired of this DIY wood stain finish. I use it on everything now! Plank walls, mail organizers, growth charts, you name it. 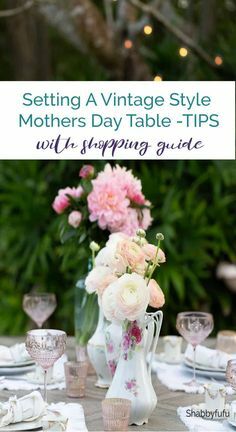 After trying this method out, I’m wishing I’ll find more tables with scratched tops on every thrifting trip. Is this one for the books, ya think? The more furniture I makeover, the more I want to keep it all. 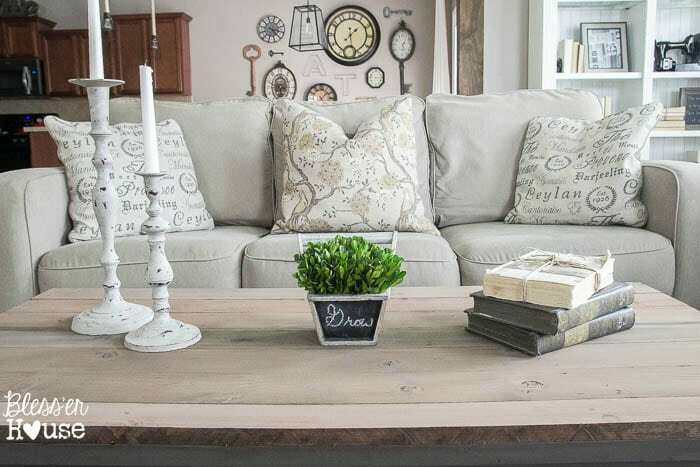 It’s totally normal for a living room to have two coffee tables, right? I mean, we don’t really need to walk around in here or anything, do we? One day, when we’re past the toy storage stage, maybe one like this can happen. This is gorgeous! It’s always a little sad when I make over a piece of furniture and I have nowhere to put it! But at least someone can enjoy it! I know! 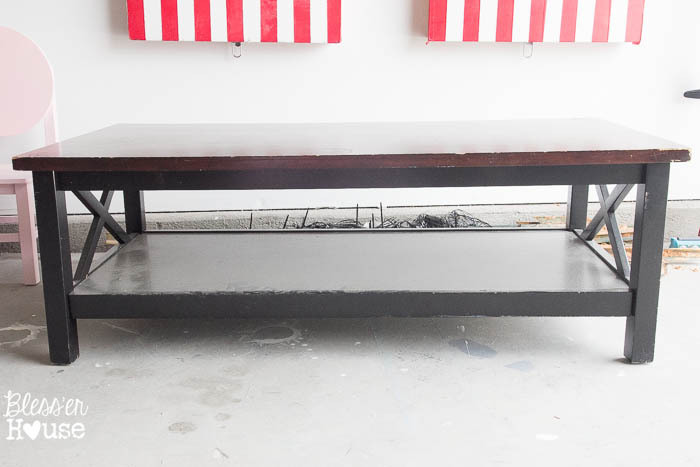 It’s hard saying goodbye to those pieces you sort of bonded with in the refinishing process. Haha I’m glad someone else can appreciate it though. 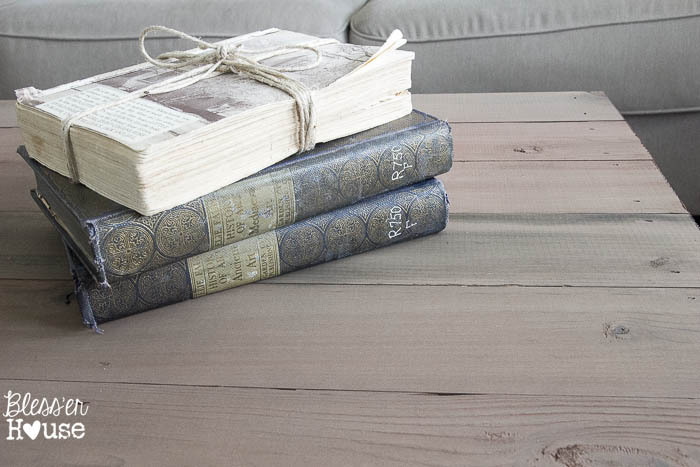 This looks just great and I really like the color of stain you used for the boards on the top of the table. 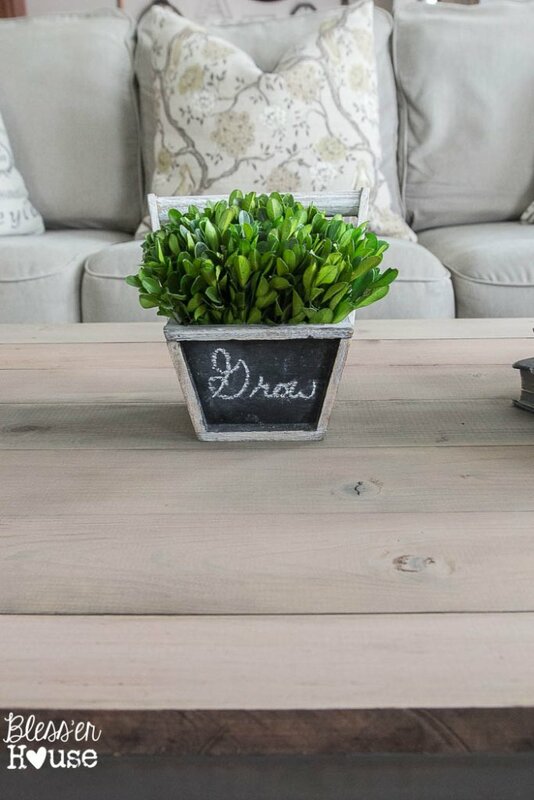 I would love to do this with a table in our family room! It’s SO awesome. I’m hooked on this stain! Thanks, Carrie! If you try it, hope it turns out well! I almost thought this was one of those trendy steel/reclaimed wood tables! Very good job fixing this little guy up! I love the way it turned out. Thanks, Rebekah! It was the look I was going for so glad it almost fooled you! 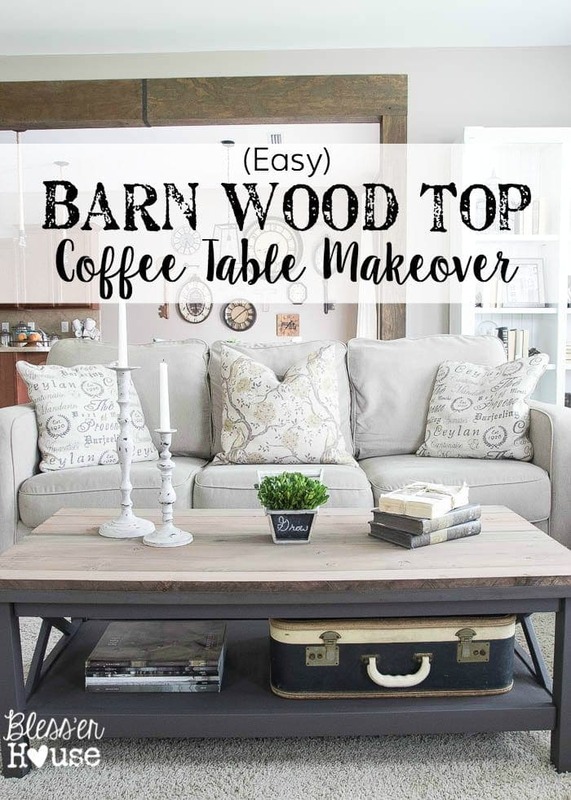 Love that DIY barn wood top! It’s gorgeous, Lauren. So wht is the wood stain you are in love with? Looks great but do not see it on the post!!!!! I quiring minds want to know!!!! Thanks….i did see if when I went back. I think the two glasses of wine made me miss it! Looks great though!!!!! Wow! Love how you added the wood to the top. What a great makeover!!! Looks perfect! Oh wow! This looks absolutely amazing! Looks like something you could get at pottery barn! The top is perfect! Well done! Wow! What a transformation! I love it. It looks really high end. Your homemade stain is so beautiful, too. I’ll have to mix up my own and try it! 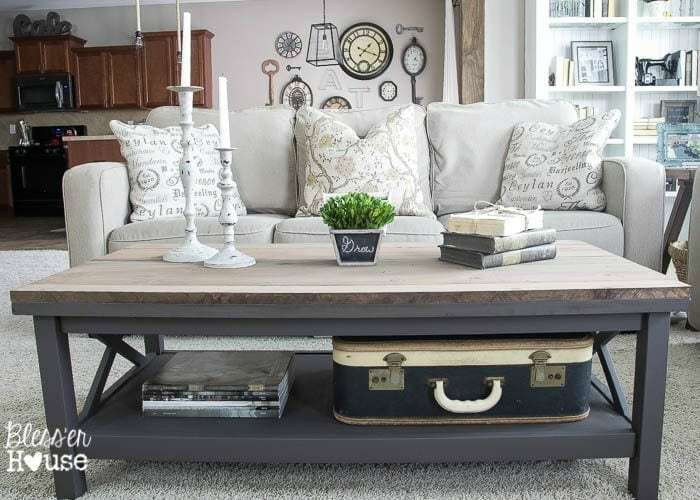 I’ve been on the hunt for coffee table ideas this week and I am in love with this!!! So inspired! I’m so glad, Jennifer! It really was so easy. I love the table makeover. The added wood on the top really makes it look like a more substantial table. What an amazing transformation. Great eye to see the potential in that table. End result looks very expensive. Oh I really love this one Lauren! Now I want to go makeover a coffee table! Featured at Be Inspired this morning. Thanks so much for sharing! Oh my gosh it’s amazing! I hope you’ll love this stuff as much as I do. I’m so glad I got to meet you and chat for a bit! This is Gorgeous! Your amazing and this is so inspiring. Thank you for your ideas. Thank you so much! We had a lot of fun doing this one. We used a brad nailer, but if you wanted to use glue instead, I’d use Liquid Nails. Be sure to clamp it too. Great, simple makeover! What kind of velspar paint do you use for your furniture??? It looks great! I recently painted dining chairs with a velspar semi-gloss (three coats over a primer and a 6 week drying time have made me not want to repeat that fiasco) Thanks for all your inspiration Lauren! I can’t remember which kind this was but I believe it was the flat finish Valspar Signature. 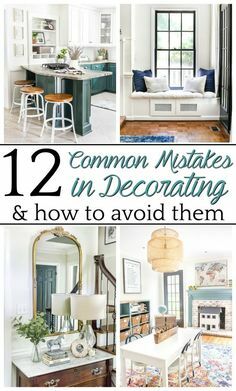 I sometimes mix Chalky Paint Powder in flat paint to make it into a chalk paint. So sorry about your chairs! A lot of times the weather can play a factor in how paint dries. If it’s really hot or raining or humid at all outside, it can take a long time to cure. If it’s raining, I don’t paint at all. We plan to paint our kichen cabinets in April or May next year when the weather is typically mild in our area. I love your gray stain…however, it looks different in the three projects I saw–the bathroom, the height chart and the coffee table. 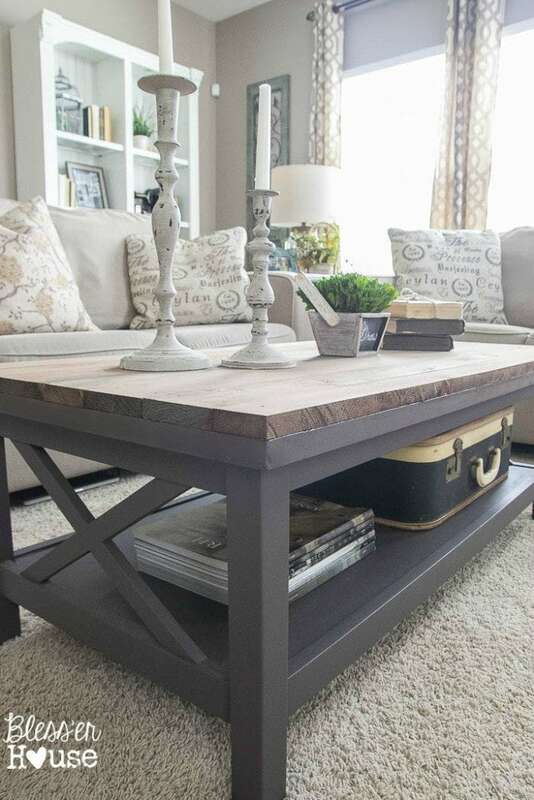 What’s the formula for the light gray stain of the coffee table? And did you add a clear coat to the top? Thanks!…I’m VERY new to all of this haha. Can you please write a post about some paintings tips and techniques. I love redoing furniture, but I feel like I always have paint drips in my pieces. Or if you have already done a post similar, can you point me in that direction please? Also, what are your favorite products? What steps do you use? Love the table. How did you attach the planks? Nails, glue,both? Thanks, Angie! We just used nails but you could certainly add glue as well if you wanted. What’s the paint you used on your wall? Love it! Thanks! It’s Sherwin Williams Perfect Greige. This is great! Thank you for sharing. Did you sand the table? 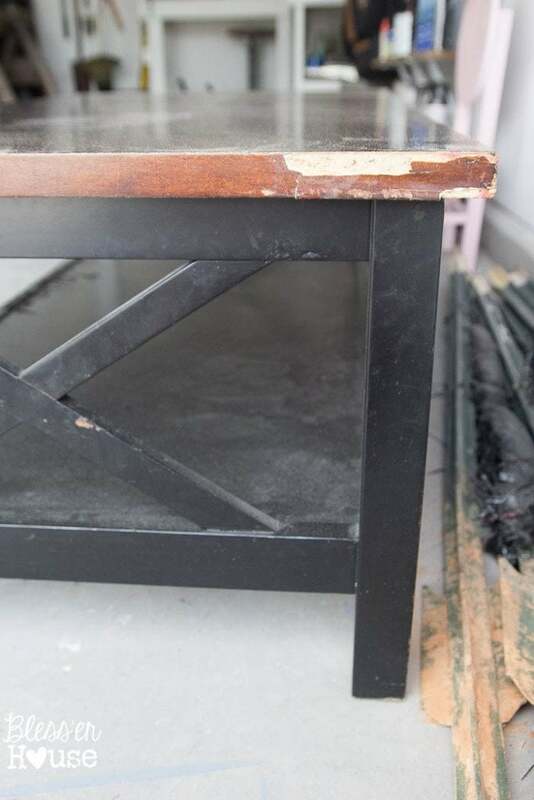 I am new to this, and will be using your stain and same paint to cover an old, but sturdy dark wood coffee table. Glad it could help, Karin! I lightly sanded the wood for the table to make sure there weren’t any splinters or anything, but the planks were pretty smooth to begin with. Hi Lauren! 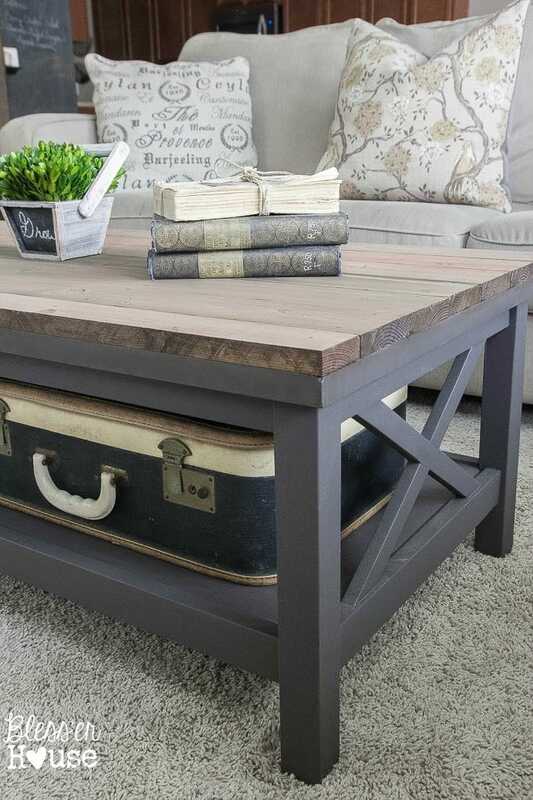 We did this to our coffee table (ironically the exact same one you refinished), and it turned out awesome!! We are having one issue. Our side planks are wider than the table because we just had Home Depot cut 1x4x8’s in half and aren’t as stable/flush as we’d like (we used a single nail at the 1/4, 1/2, and 3/4 mark). Any suggestions on how to fix? Have you ever run into this issue? 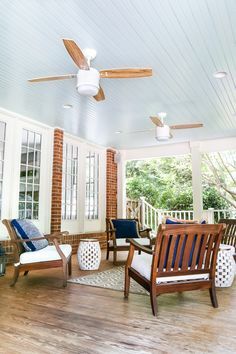 Oh okay, so I think we ran into that issue too, but beforehand, I measured the table, measured the width of the planks, and with the 1/2 inch overhang we were going to end up with, I just had my husband take that little bit off with a straight cut using the circular saw so it would end up flush. Hi Lauren, I just finished putting the steel wool vinegar solution on about an hour ago. I do love it and I think the table is going to look great. Mine does look darker than yours on the top, the sides seem to be the same. Did you sand the top any after you put the stain solution on? How long did you wait before you put the polyurethane on and did you put polyurethane on the painted table or just the top. Thank you. Hi Irene! So sorry for my delay. I did not sand the top of the wood, but you certainly could if you wanted to lighten it some. That will give it an even more rustic/distressed look too. I waited 24 hours before putting polyurethane on top. What color is that gray you used?? It’s so pretty I love your style!! You did an amazing job. Love it… fab! The base color is great and the top is a beautiful gray. I should be so lucky to find a table like this to make over! Absolutely! I would highly recommend that! I love that table. Wanna sell it? How did you attach the wood to the table top? Glue and screws? Yes, wood glue and wood screws. Do you have step-by-step instructions on how you achieved this look? I wan’t to give it a try, but don’t have the first clue of where to begin.